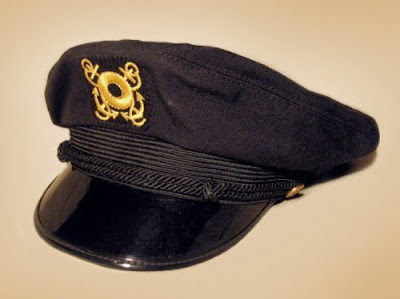 I have been looking for one of these correct boat cap for years. And there it was on eBay. With only about 80 views, who would want one of those? Well, 34 bids later I have spent way to much on it, but will have it in a week. Anyone else interested in a correct hat? Not the cheap stuff that looks like a kids goof, but the real deal….We are now in the works to make custom one off authentic Boat Hats. Yes from the real original company from the original patterns. We are also in the works for nice quality shirts and other clothing. If you have interest, comment away, we are feeling out the market. No on the hat but yes to a WoodyBoater Tshirt under $20. I'll wear mine at book signings! How about some Gar Wood Shirts and hats! Sold – They will quickly become a "WoodyBoater Fashion Statement"
Will it add a point or two at the shows if I wear it and sit in the boat at the same time? I'll clain I just purchased the boat new and while on my first outing came through a time warp. This is just the way to get noticed, in a good way? What's the SPF rating? Ha, all kidding aside, we are now in the works to replicate these hats. Stay tuned. Please tell me how to buy one of those Captains hats! Have a 1955 Chris-Craft Sea Skiff…need a hat like the one shown in either blue or white! Please contact soon! I need one of those also!!! I’ve been looking for one like that for years also. Please contact me if you decieded to make the hats.